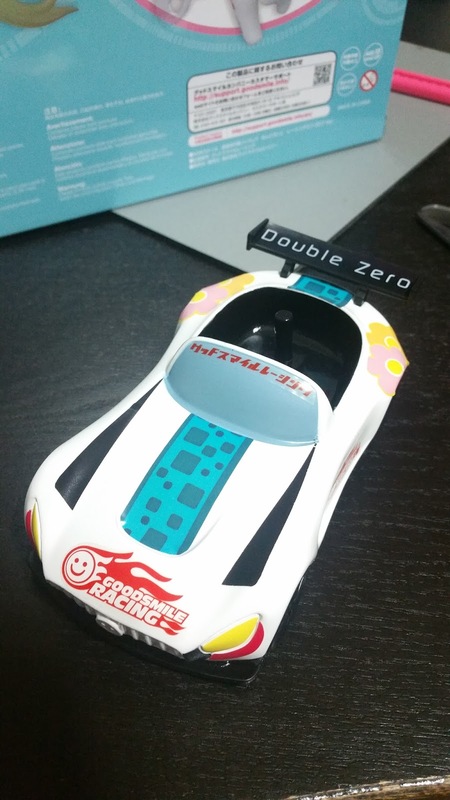 Here is another Miku Nendoroid and this time, it's Racing Miku 2017 version! 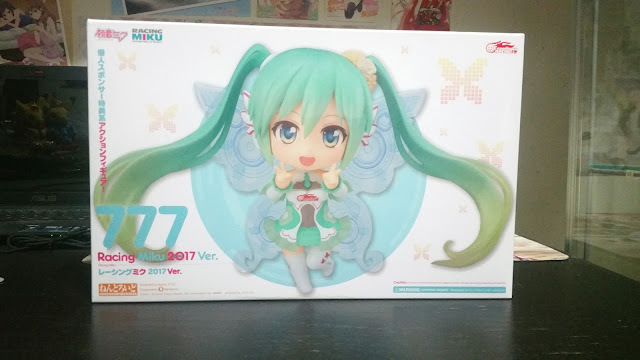 If it isn't obvious yet, I'm finally opening all of my unopened figures and I hope to get them all done before... maybe December? Without further ado, let's look at this figure! 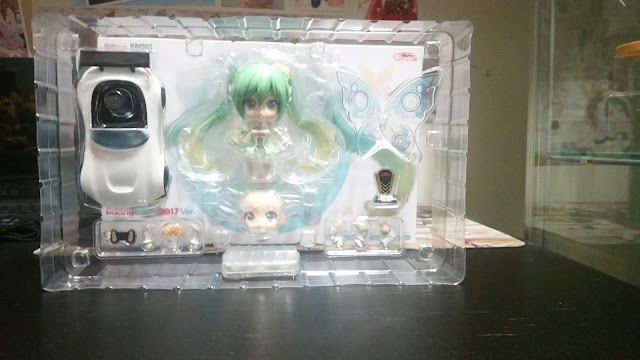 The box of Racing Miku has always been humongous, partially due to the fact that it always comes with a car and stickers to emulate the race car being used. 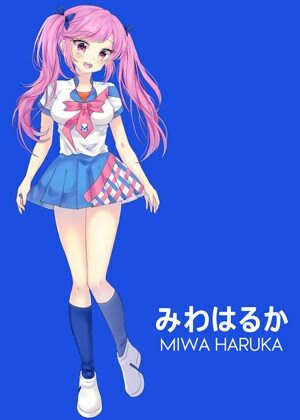 This year's Miku is based on a fairy, and is illustrated by Tony. 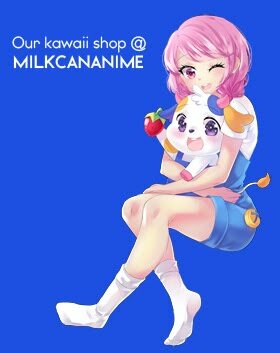 While I have my gripes about the scale figure (which my friend, a fan of Tony's artwork, has preordered), this Nendoroid is simply too cute and irresistible for me. 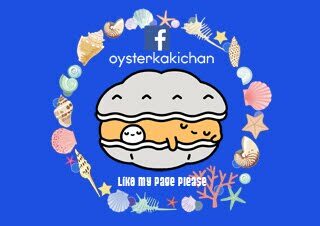 So, here she is! 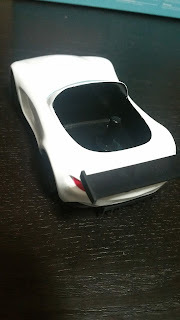 The front of the box is mainly in white and rather clean-looking while the back features slightly more color and design. 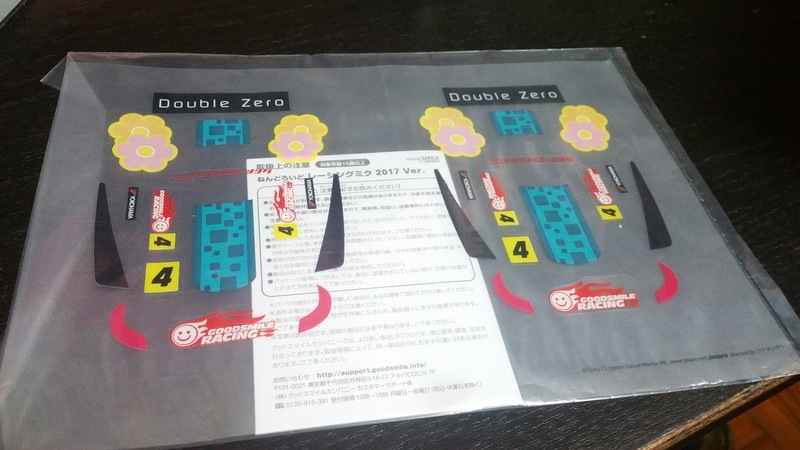 That being said, the entire packaging is rather simple-looking and slightly plain, although I think that by doing so, it doesn't outshine the printed pictures of the Nendoroid itself. 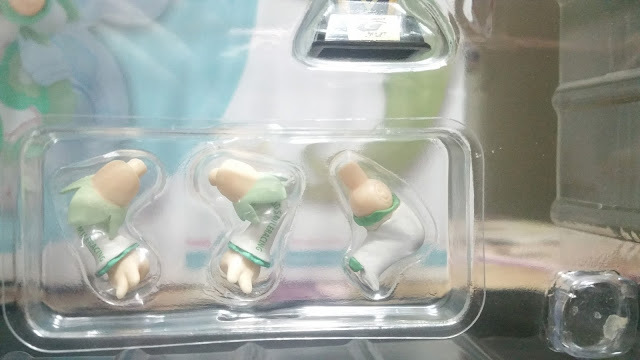 Racing Miku figures are complimentary to the donation (8,000 yen) and thus are "exclusive" since you wouldn't be able to get them otherwise. 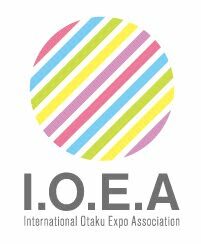 However do note that for the 2018 version, it isn't as exclusive as you are still able to pre-order her at stores (for 6,000+ yen) although it definitely is less worthwhile than getting the "exclusive" one which comes with additional items such as a personal sponsor card and acrylic keychains/stands which are 1,000+ yen each on pre-order. 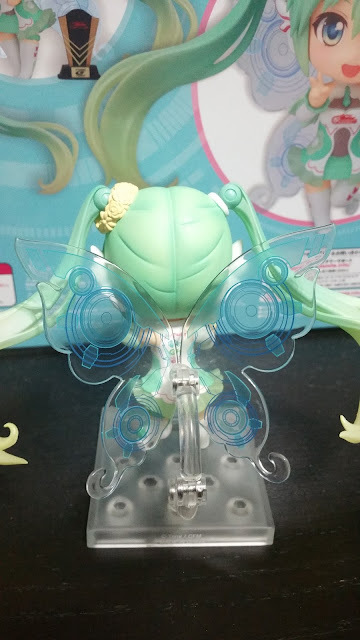 Leaving that aside, let's look at the different compartments of Fairy Miku! She comes with quite limited pose-ability but the main bulk of the price is usually due to the car included as well as exclusive status. 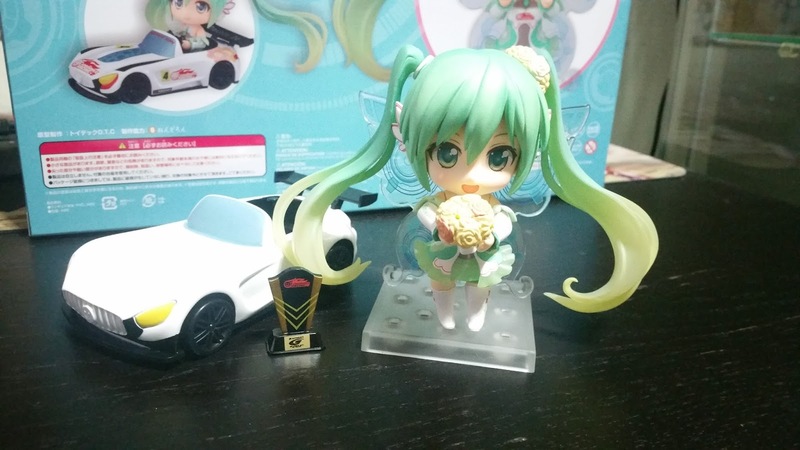 And as usual, Miku comes with accessories which you can use for posing Miku both inside and outside of the car. 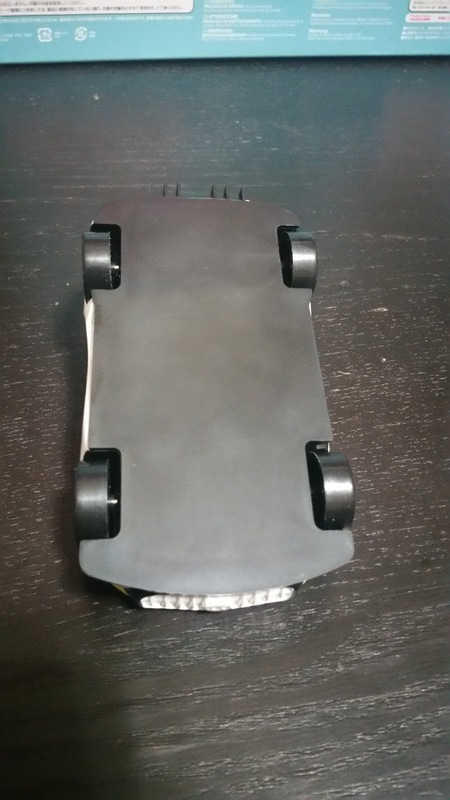 As you can see in the image below, there's the steering wheel of the car complete with hands to hold, as well as a flower bouquet which you can use when you simulate her victory! 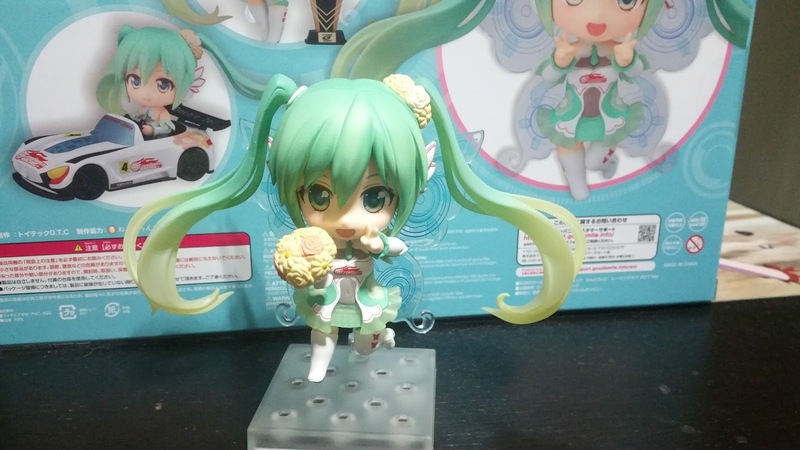 Miku also comes with a bent leg for a cuter pose as well as hands with peace signs which you can use for a cheery double peace pose! Additional accessories include her fairy wings and a trophy. First, let's look at Miku with a bouquet in her right hand and a peace sign for her left. By using her bent leg here flushed out to the side at an angle, it really helps to complete the cute aspect of this figure. 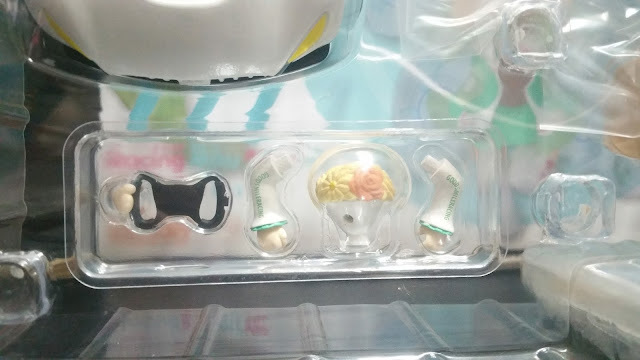 There are two aspects which I would like to mention about Miku's hair would be the gradient from green to yellow that adds to the soft feel this figure comes with, and the floral hair band on her left twintail has the same colors as her bouquet and really go well together! 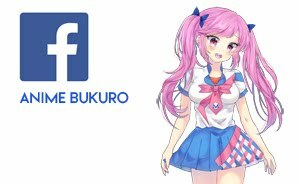 Next, let's take a look at her outfit! 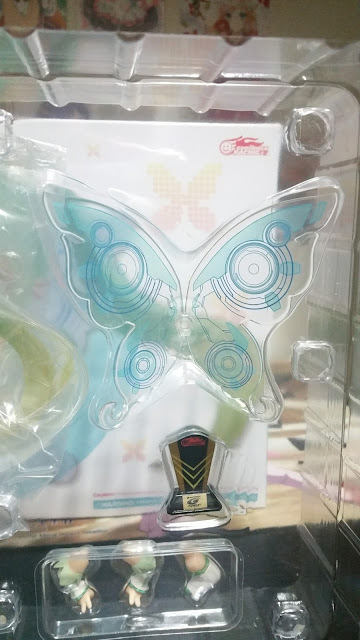 It comes with a mass of white and light greens, but has a few parts highlighted by red (such as the butterflies on her boots as well as the Good Smile Racing logo. 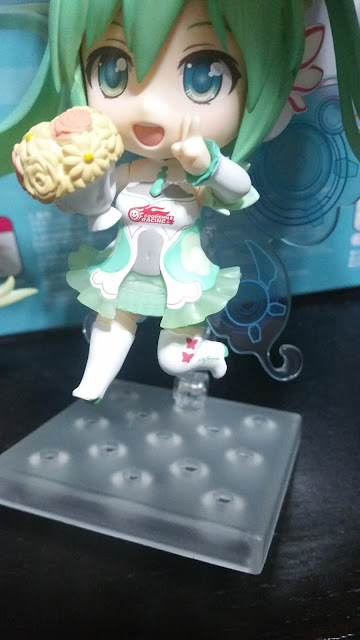 Her ears also comes with an ornament covering her ears, which plays up the fantasy aspect for this fairy themed Nendoroid. She comes with this small green tie to boost the kawaii aspect, and some special design for her outfit, as demarcated by the translucent grey parts. You can even see her belly button through it! Her wings uses a transparent plastic part with a light dusting of blue from the middle of the wings and designs to create a futuristic fairy appearance. 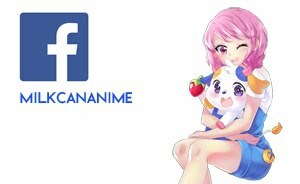 I was initially quite skeptical as to how they would pull this off but the end result isn't too far from amazing. The only downside is that you are unable to use it when posing Miku in the car. I do wish they included a compromise for that. 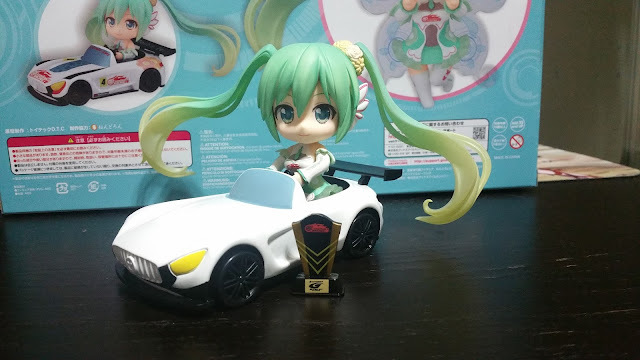 Next up, we have Miku in the car, along with the trophy. 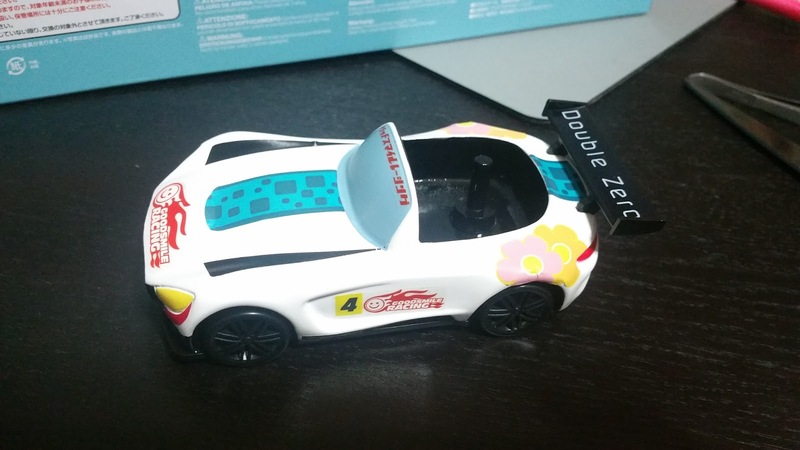 I wouldn't go into details about the trophy as it is pretty self-explanatory but I'll like to show how the car looks before and after using the decals provided. 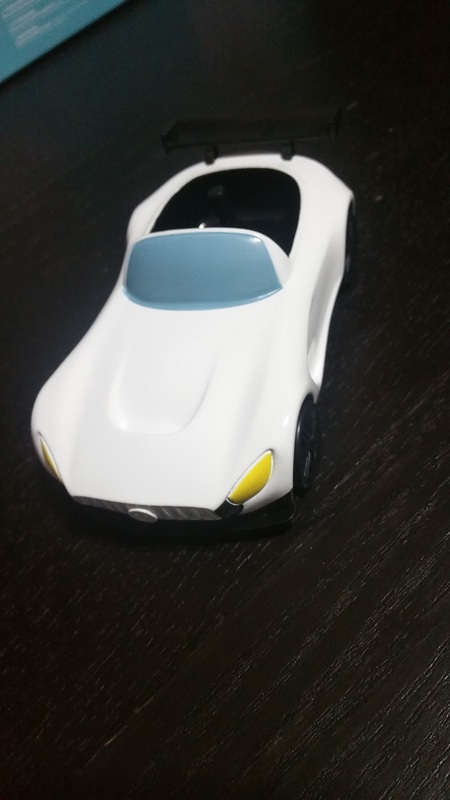 Without further ado, let's look at a 360 of the car without any decals! 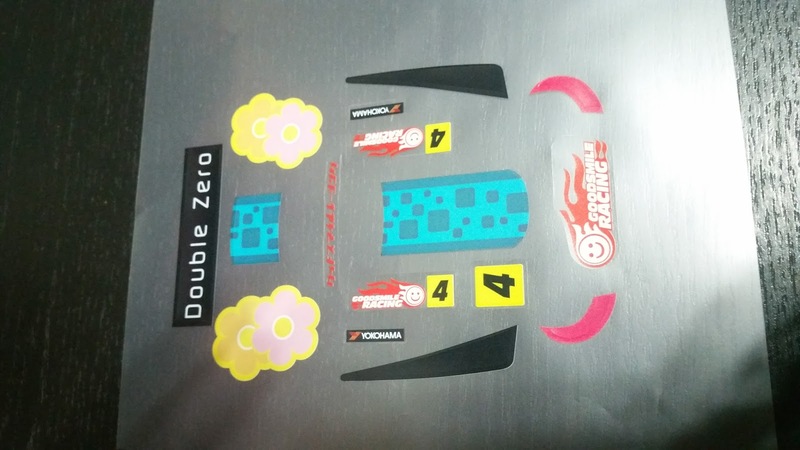 GSC has provided two sets of decals that you can use to paste on your car to make it look exactly like the one shown on the box. It also comes with a set of instructions on which to stick where in case you are uncertain. Do note that for my case, there are some stickers on either set that wouldn't come off well, and so I had to use the extra set to make up for it. 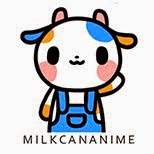 Do treat each pasting like you wouldn't have an extra decal to use in replacement, and you'll mess up less. The way the decals are arranged are exactly how you should put them on the car and it is actually rather simple to discern what should go where. Though, do note that the oil and dirt from you fingers may result in the decals being less sticky so I do recommend using something such as a pair of tweezers to carefully position the decal well. Re-pasting the decal would also obviously lead to it being damaged or being less sticky. The most difficult decal to paste would be the yellow and pink flowers as I felt that they didn't line up well with the grooves and different angles of the car where it should have been pasted on. 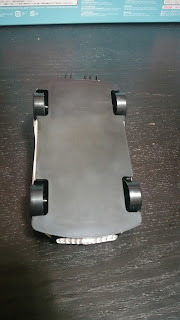 It wasn't very nicely done even on the prototype, so there's that as well. 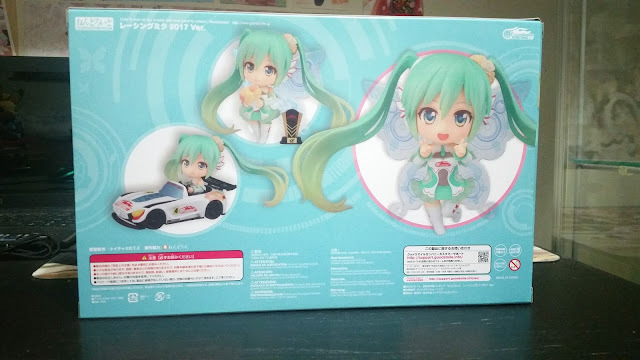 It's definitely a very good feeling to finally own a Racing Nendoroid since most of them rise in price after release! 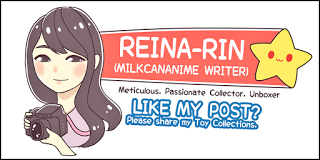 Keep a lookout for her in the aftermarket if you do like this Nendoroid and I hope you'll find her at an affordable price! No Comment to " Figure Unboxing and Review: Nendoroid Fairy Racing Miku 2017 (Vocaloid) "